...that the Iron Lords unintentionally awoke Rasputin from hibernation when they trespassed into Site 6 to acquire SIVA? SIVA is a form of self-replicating nanotechnology developed by Clovis Bray during the Golden Age. Originally designed to assist in the construction of extrasolar colonies, it was used by the Warmind Rasputin as a weapon against the Iron Lords, and later by the Splicers of the Fallen House of Devils. SIVA was once a Golden Age breakthrough in self-assembling, self-replicating nanotechnology, created by Clovis Bray to accelerate humanity's colonization effort. The technology had the ability to create nearly anything that anyone could ever need. It would be used to create new structures and colonies on new worlds faster than regular construction methods. It was considered as an amazing breakthrough in technology. It was later rediscovered by the Iron Lords during the early City Age, but it turned against them with the aid of the last Warmind, Rasputin, who was awakened from his centuries-long hibernation when the Iron Lords tried to steal SIVA in their attempt to utilize it for humanity's betterment. Unable to destroy the virus, and with most of the Iron Lords being puppeted against each other under SIVA's control, Lady Jolder sealed both the virus and all of the Iron Lords (with the exception of Lord Saladin and Lady Efrideet) within its bunker, deep within the bowels of the Cosmodrome. It was later rediscovered by the Fallen, who took it to be the perfection of technology and sought to perfect themselves entirely, freeing them from their dependency on ether and mortal flesh. Alerted by Lord Saladin, the Guardian soon put a stop to this, destroying the Replication Chamber and later ending Aksis, Archon Prime. "The complex is ready for wholescale replication of the SIVA nanite. We are waiting for your signal to start." "Thank you for your faithful service, Dr. Zhang. I look forward to the wonders that come from this replication complex. The New Machine Age, shall we call it? Let's begin." — Dr. Zhang and Dr. Willa. Clovis Bray began work on SIVA at the height of the Golden Age, alongside a similar project known to the Guardians only as Transmission. While Transmission was intended to enhance the strength, speed, and intelligence of prospective colonists using nanomachines, SIVA used nanomachines to break down matter and reconstitute it in order to rapidly construct entire cities. The Transmission project was eventually shuttered after it caused unforeseen side-effects in test subjects, and Clovis Bray focused entirely on SIVA, which was later completed and approved for deployment. So confident was Clovis Bray in SIVA's capabilities that they eschewed adding safety measures, such as a kill switch. The first SIVA replication chamber, designated Site 6, was built within the Cosmodrome in order to outfit the colony ships. One such colony ship was the Exodus Black, which carried a cache of SIVA on it's journey to colonize Kepler-186. What became of the cache is unknown but it may have survived the crash on Nessus and may be in the ruins of the Exodus Black. At some point, SIVA was transported to worlds outside of the Solar System under the direction of the Warmind Rasputin. "Felwinter tried to communicate with the Warmind. Called it Rasputin. ~consume enhance replicate~ Said he could make it understand. Tell it we meant no harm. Rasputin didn’t answer with words." Many years later, Rasputin was reactivated when the Iron Lords, hoping to harness SIVA to bring about a new Golden Age, trespassed into Site 6. Rasputin treated the intruders as hostile and activated its defenses. Unable to communicate or reason with Rasputin, the Iron Lords still managed to infiltrate Site 6 and release the nanotech only for Rasputin to turn it against them, infecting several of their numbers against their fellow Iron Lords. In the end, almost all of the Iron Lords and Iron Wolves sacrificed themselves to stop SIVA and seal it within its complex. Rasputin ceased its onslaught once it deemed Site 6 was re-secured, and began passive observation of the Guardians. 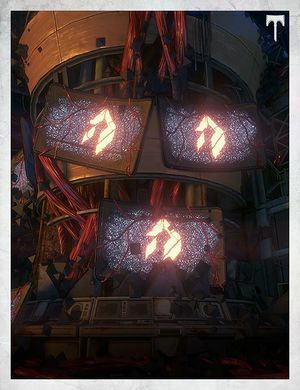 Lord Saladin Forge, one of the surviving Iron Lords, quarantined the Plaguelands to prevent SIVA from ever being unleashed again. "What is this complexity? ~consume enhance replicate~ The machine of a thousand parts, fashioned by single mind. From where does such complexity arise? What does the creation of a mind require? In the long march of life’s procession, order is created from disorder. The rise of complexity is not promised. Such things are not inevitable, and yet here I stand. ~consume enhance replicate~"
A year after the Taken War, while looting ancient tombs from the Golden Age, the Fallen House of Devils managed to unearth SIVA once more. Realizing the potential of this nanotechnology, their Devil Splicers, led by Aksis, Archon Prime, imbued themselves with it and began infecting their fellow Devils in an attempt to transform themselves into machine gods. Unable to contain the SIVA Crisis on his own, Lord Saladin began seeking out Guardians to help him form a new generation of the Iron Lords to defeat the mutant army, avenge his fallen comrades and seemingly end the threat of SIVA at the time. SIVA is also known as Ironsbane, presumably for defeating most of the original Iron Lords. SIVA (or otherwise known as Shiva), is a Hindu word meaning the destroyer, one of the three chief deities of the later Hindu pantheon, the other two being Brahma and Vishnu. Siva is also the god presiding over personal destinies. from Sanskrit Śiva, literally: the auspicious (one). This may be the reason for the plague's name in Destiny, due to its lore as a destroyer. Nanotechnology is a branch of technology that deals with dimensions and tolerances of less than 100 nanometers, especially the manipulation of individual atoms and molecules. SIVA is briefly mentioned by Failsafe in Destiny 2. In Destiny 2, the emblem of SIVA is featured on The First Domino jumpship made available during Festival of the Lost. Ghost Fragment: Ghosts 2 reveals that Ghosts can be infected by SIVA. Though the Light repels most of the infection, the Ghost in the Grimoire Card occasionally verbalizes the console output of the dormant SIVA within it, such as identifying Obsidian, recalling memory fragments, and the errors generated by the now-ineffective strain. Concept art of SIVA plague spreading across the Plaguelands.